Michael F. Barnes, a graduate of Greer High School, has owned and operated Barnes Towing for 36 years. Mr. Barnes currently serves on the Public Safety and Human Services Committee and is Vice Chairman of the Planning and Development Committee. Mr. Barnes has served on the Greenville County Planning Commission. 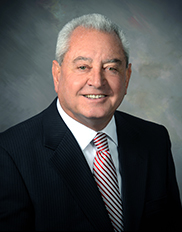 He is past president and is currently on the Board of Directors of the Towing and Recovery Associations of South Carolina, an active member of Northwood Baptist Church, The Greer Chamber of Commerce, Bailey Lodge and Hejaz Shrine Temple. Mr. Barnes also participates with Greer's Relay for Life. Mr. Barnes donates his towing services and facility to the local Police and Fire Departments for continuing education and training. Mike has been married to Lynn Barnes for 43 years. They have 2 daughters, Julie Barnes and Allison Crain, a son-in-law Todd Crain, and 2 grandchildren Makayla and Noah Crain.